Now joining us to understand how this man became the national hero that he is today is our guest, Dedrick Asante-Muhammad. Dedrick is the director of the Racial Wealth Divide Project at the Corporation for Enterprise Development. Thank you so much for joining us, Dedrick. DEDRICK ASANTE-MUHAMMAD: Thanks for having me. DESVARIEUX: So as I said in the intro, Dedrick, we’ve really seen this transformation of MLK. You heard the description, William C. Sullivan of the FBI, how he described MLK. But now we have even President Obama mentioning MLK in his State of the Union address, and constantly we hear about MLK being this national hero. How did this transformation even happen? MUHAMMAD: Well, I mean, it’s–in some ways it’s not that irregular that people of the past who were quite controversial, even considered radical at the time, years after their death start becoming appropriated into a national memory and start becoming almost heroic. I mean, when even 20 years after his death, it was still controversial, with Ronald Reagan making jokes about, well, we’ll see if Martin Luther King was a Communist or not, even as he was signing into law recognizing that Dr. King’s birthday would be a national holiday. So it’s, it’s not, it’s not irregular, but it is kind of amazing when you look at where he was in ’67-’68, and how he is used today. DESVARIEUX: But Dedrick, after MLK was assassinated, those who kind of took on his, the struggle, why didn’t they push back on this narrative that America was creating around King? MUHAMMAD: Well, I mean, it’s always a challenge, because those who are fighting for King to have mainstream acceptance, they’re hoping that his radical ideas will be embraced. But when the mainstream say, okay, we can take him in, but we’re going to take him as we want to remember him, we want to take him as a patriot who loved America–I think a great example of this is if you look at the monument of King in Washington, DC. I was talking to a person who was helping to put that together, and he was bragging about how they took out any quotes that directly dealt with race, because he thought we really were in a post-racial society, we’re past these racial problems, and didn’t want to limit the legacy of Dr. King. DESVARIEUX: A legacy that was around racial justice. MUHAMMAD: King was–everyone knows he’s a racial justice leader. But the way that America kind of accepts him is as something beyond that, as a nonviolent, loving person who loved America, and who that we should all really now understand that we’re past racial inequality. We shouldn’t talk about racial inequality. We should talk about the greatness of America and how we should just move forward together. So it’s a very reactionary use. I mean, you find the most reactionary politicians using King to fight against affirmative action, to fight against Black Lives Matter. 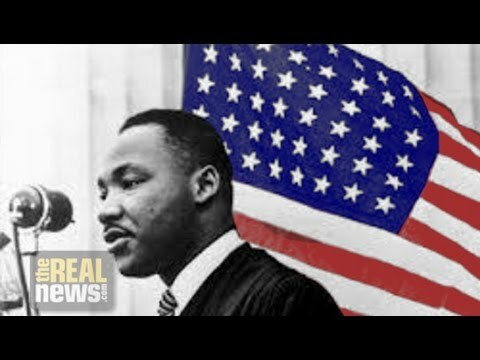 And so those of us who, from future generations, need to say, no, this is the King that stood up against the Vietnam war, that said that those who want to deceive themselves into believing this is an equal-opportunity society are people who are in great vanity and are doing great threats to racial minorities. So there’s still a radical legacy that we need to put forward, and continue the fight, to not allow this kind of whitewashed, all-American dream King, and start dealing with the American reality. DESVARIEUX: Okay. And I want to turn to his book. In the second edition of King’s book, Where Do We Go From Here: Chaos or Community, historian and King’s speechwriter Dr. Vincent Harding, he wrote that King was always careful to say he was not a Marxist. But King did call for a better distribution of wealth. He was often very critical of capitalism. But we never really hear that sort of part of King’s legacy being included in this narrative of who Dr. King was. How did they end up sort of whitewashing this anti-capitalism stance that King had at times? MUHAMMAD: It was whitewashing, I think, his entire history, legacy. And not just King, but the civil rights movement. And I feel like really what’s happened is the country needed a narrative about, once they recognize that straight racial inequality, Jim Crow, was wrong, they needed a narrative about how it was fixed. And so the narrative is there was a civil rights movement, then the entire country recognized it was wrong, and they moved on. And they place King and his nonviolent philosophy of this idea that we will not strike back, and we will look for the love and acceptance of the other, as that’s what happened. But what people forget is that King didn’t die after a victory, King was killed in the struggle, and that the struggle was still going in many ways, many of the black liberation movements of that time were, there was SCLC or SNCC, or what have you, were pretty much torn apart. And King was moreso in despair at the end of his life. You know, people keep hearing about the I Have A Dream speech. By ’67-’68 he was saying his dream had turned into a nightmare. So there wasn’t this idea that America had become all of a sudden racially integrated. But the narrative needed to be, well, what do we do with this struggle? And the narrative became that King was right, and the whole country came to his side even though those who were under King continue to struggle in the ’70s, ”80s, and those who continue that tradition of struggle today. I mean, clearly you see in the streets of America that there is a Black Lives Matter movement, there’s a fight for racial, economic inequality–for greater racial and economic equality. So many of these divides haven’t closed at all. I like to point out, 1963 March on Washington for Freedom and Jobs. Like, that was wiped away. That–and in 1963, African-Americans had twice the unemployment rate of whites. And today, 2016, African-Americans have twice the unemployment of whites. It hasn’t moved. So much of the struggle is still something to be dealt with. DESVARIEUX: I remember, off-camera before we started the interview, you mentioned Dr. Harding came out and spoke about Dr. King and his anti-capitalism critique. Can you talk about that a little bit? MUHAMMAD: Yeah, I mean, Vincent Harding who was a student, friend, even a mentor to Dr. King, he was writing books in the late ’80s, early ’90s trying to–he already saw that King’s memory was being co-opted into something that it wasn’t. Instead of a radical call for change saying that there must be a spiritual revolution, and a material revolution, in this country. King started becoming a, kind of an American icon about America–I mean, we use his speeches all the time. We hear that America was always based on diversity, and it’s un-American to say that these people don’t get equal access. But at the heart of America’s history has been inequality, white supremacy, keeping the other outside and keeping benefits for a few, and there has been a radical American tradition that’s challenged that, but it was never the mainstream. DESVARIEUX: Okay. I want to talk about how King was a student of W.E.B. DuBois, and in particular, we all know about the Talented Tenth that W.E.B. DuBois coined that phrase. But there was also a need, he also said there was a need for a Talented One-Hundredth, who would actually use their relative advancement to help the black community. King, too, was a part of this, this advanced black elite, really. But he was critical of that elite, and he was very concerned that they weren’t necessarily going to, to further the movement and support the movement in ways that they need to be. How do you, sort of, see the situation today in terms of the black elite and the struggle? MUHAMMAD: It’s not radically different than it has been in the past. I mean, King, I think, was critical and cognizant of the challenges of being in the black elite because he was from that. You know, he was offered a lot of opportunities to have much more financial success, have much more mainstream success. I mean, people conflate, like, the black church–some people understand the black church as being a radical movement, some understand it as a conservative movement. But in many ways, I mean, King was looked at as not being a real preacher because he talked about civil rights. He talked about inequality. The National Baptist Association was strongly against Dr. King. So Dr. King recognized that with his privilege, he wanted to use that for the movement. And I think there’s always this constant tension in the black elite, is are you really out there to try to make a structural change so all people can have a better life? Or are you trying to make changes so you and your family could have a better life? That’s been an ongoing tension. And really, any dispossessed group, of those who are making it, are they going to really fight and sacrifice, and not get as far as they could have, by trying to help the whole go forward? Or are they just going to focus on themselves? DESVARIEUX: Okay. Let’s talk about the state of the black community, and minorities communities in general, in the United States. There’s a report that comes out annually, the United for a Fair Economy. They publish this annually about the state of the dream in America. What did they find in terms of the state of the dream that we’re dealing with today? MUHAMMAD: Yeah. You know, I was with United for a Fair Economy when we started the report. And we started the report in 2004. Because even then, we were trying to help combat the narrative that, that even back then we had this narrative of post-racial. I mean, we were kind of getting past this Clinton booming economy, and the idea that, you know, everyone’s doing well and we’re just on the horizon of when there will be great racial equality. And just wanted to point out then, in 2004, and it’s pretty much stayed the same today, that it would take another 500 years for income inequality between blacks and whites to close, going at the rate that it has been going since the death of Martin Luther King. It would take even longer to–. MUHAMMAD: Why is that. It’s true, because the economy, the economic opportunity, the celebration of the great black middle class, and then blacks breaking down all these barriers, hasn’t really occurred at the level that people like to talk. I mean, there is always one or two black people that have made it. But the masses of African-Americans still have not–and actually, I think one great structural understanding is just as some civil rights barriers were tearing down, the economic barriers were building up in this country. This country used to have a much more progressive economy, where low or moderate income people had a larger share of the wealth. But by the late ’60s, and even, you can see this in some of King’s writings, he started seeing that this was changing, and that more and more of whatever economic success was occurring was being concentrated at the wealthiest. So just as African-Americans started getting more and more out of poverty, more and more in the middle class, they started losing manufacturing jobs, which was great, kind of, entries and staples of the middle-class economy. So we kind of had somewhat of a progressive area in race relations, but a regressive area–regressive era economically. But we still maintained a regressive kind of police state, which we’re also dealing with. So again, the divide and the barriers really haven’t been closed since the death of King, definitely hasn’t been closed because we elected a black president. And I think the question now is, you know, is anyone seriously going to take this challenge on? How are we going to honor Dr. King’s legacy and, you know, and finally get some of those victories he was fighting for at the end of his life? DESVARIEUX: All right. Dedrick, thank you so much for joining us. MUHAMMAD: And thanks for having me.